The Holiday Trio box has three different cookies in it: to the left is the burnt sugar and fennel cookies, the middle is the salted rosemary, and the right is the espresso chip. 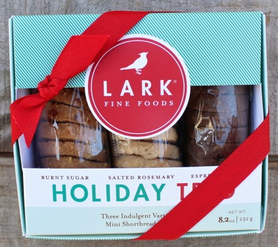 I received the Lark Holiday Trio box which included these cookies in my December Knoshy Box! When I have shortbread cookies, I like to have a rich black tea to go along with … perfect for dipping! I chose This English Breakfast Tea from Tea of Life to drink with these cookies. Yum! OK, I am not a fan of coffee. No, that’s not completely accurate. I used to be a big fan of coffee, but, I realized at some point that it was that morning cup of java that was making me feel ill around 11 am every day. And what I’m not a big fan of is feeling ill. So, I stopped drinking coffee and started drinking more tea. At the time that I was drinking coffee, I was also drinking tea but I was more of an occasional tea drinker. I fell in love with tea and the rest is history. So, whenever I’m encountered with stuff that … has coffee or coffee products in it (and espresso is coffee) I tend to be a bit … leery of it. And so I was leery of these shortbread cookies. But, I do love the other cookies I’ve tried from Lark so I was hopeful. And these are tasty. A strong coffee taste to them and notes of chocolate. I wish there was more chocolate but every once in a while, I get a bite with big chocolate flavor and I like that. I love the texture of these cookies. Lark manages to nail the shortbread texture perfectly in their cookies. It’s sort of flaky and layer-y and buttery and crumbly … and just plain WOW! These were tasty. Of the different Lark cookies that I’ve tried, I’d have to say that these were my least favorite, but that’s because of the espresso. I would have much rather had the spiced chocolate krinkles cookies from Lark … they sound amazing! However, these cookies do get bonus points for being made with whole wheat. It makes me think I’m eating healthy when I know that I’m not. But, the illusion helps me feel less guilty … somehow. So, I liked them … but didn’t love them as much as I’ve loved the other Lark cookies. Still real good though. Alright … I know I’m still really behind … well, that’s because I’ve not been posting. Funny how these things just keep piling up when you don’t do anything about them, huh? Anyway … this is a “combination” review, because a friend of mine sent me a sample of Wildtree’s Alfredo Extraordinaire Sauce Mix and I received a package of Sfoglini Bronx Brewery Pasta in my February Knoshbox. So, I decided to make Pasta Alfredo with the Spent Grain Radiator pasta that I received in my Knoshbox using this VERY EASY to make Alfredo sauce from Wildtree. These BxB Radiators are made with spent grains from the brewery’s flagship Pale Ale beer. 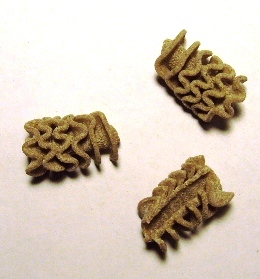 The five different barley malts create a unique, rich flavor in the pasta that must be experienced. The Name Says It All – This Alfredo Is Extraordinary! Anyway, I like that this pasta only takes about seven minutes to prepare. The instructions on the package say 5 – 8 minutes, but after testing it at five minutes, it was still a little more firm than I wanted it to be. 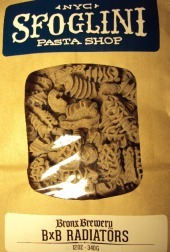 However, seven minutes on my stovetop, in my kitchen … produced just the right texture for this pasta. On it’s own, the pasta has a pleasant flavor. It is tastier than what I’ll call “white” pasta which is something I seldom buy anymore anyway, because I like to think that the whole wheat pasta is better for me and my family. Even if it isn’t, I like to live under the illusion of selecting the healthier option. I like the texture of this pasta, it doesn’t taste or feel mushy, and it’s comfort food taken to a tastier, more satisfying level. When tossed with the Alfredo Estraordinaire Sauce Mix from Wildtree, this pasta goes from good to GREAT. As I mentioned before, the sauce mix from Wildtree is extremely easy to prepare. Simply melt some butter in a saucepan with some milk (I used a 1:1 ratio of half and half to 1% milk, mostly because we didn’t have enough of the 1% milk in the fridge tonight), Once the butter is completely melted, whisk in the sauce mix until completely incorporated and smooth. I like the way the sauce sort of infiltrates the grooves of this radiator style pasta and clings to it so that I get lots of yummy alfredo taste in every bite. The sauce tastes cheesy, creamy and it is nicely seasoned. I didn’t add additional seasoning to the bowl of pasta except for a couple of grinds of freshly ground pepper which is something that I add to just about every dish I eat. I garnished the top with a light sprinkling of fresh Parmesan cheese. It is a very flavorful sauce … not at all bland, and I like the way these two products work together. The pasta is filling and delicious. The two together make for a seriously tasty supper, and it took me less than ten minutes to throw it together! To learn more about this product and others from Nitty Gritty Grain Company, visit their website. This mix has a robust corn flavor, thanks to a blend of two organic corns: Yellow dent and Wapsie Valley, a heritage variety. The coarse grind gives it an charmingly rustic, grainy texture with a satisfying tooth. The included recipes on the inside of the label are easy as pie (or, as the case may be, cornbread). Just mix, bake or griddle, and serve. Catherine recommends substituting water in the recipes with milk, yogurt or sour cream (or silken tofu as a vegan alternative) for additional richness. The cornbread and pancakes are a delicious breakfast, but also try them as a foundation for baked beans or Southern-style barbecue. A day or two before my Foodzie Tasting Box arrived, I remember craving cornbread! I had no idea that I would be receiving a cornmeal mix in my box, so it was either intuition or a strange coincidence. Either way, I’m very surprised by what I’m tasting from this cornmeal mix! I made six cornbread muffins (and I have enough mix left over to make another six muffins, or perhaps a few cornmeal pancakes, which is what I think I will end up making). It’s easy to prepare: measure out the mix, add a little water and oil (I actually used melted butter instead) and 1 beaten egg. Stir until mix is wet (remember, don’t over-mix muffin batter!) and evenly distribute into a lightly greased muffin tin (or instead of lightly greasing, you can use cupcake liners for super easy clean up). After measuring out the first three muffins, I decided to change things up a bit and I added a little bit of cheese (I used a Mexican blend of four cheeses), and a few jalapeño slices that I removed the seeds from and diced up fine. The first three muffins were incredible. The flavor is incredibly light and yet hearty in its own way. Delicious corn flavor, slightly sweet and nutty. While most cornbread tends to be rather dense… this has a delicate kind of quality to it. The second set of muffins (with the cheese and jalapeño) were also quite amazing. I think I should have added a little more cheese, because I found that rather than taste cheese, what I’m noticing is the flavor of the corn REALLY emerging. I added just the right amount of jalapeño though, as these have a kick to them without being too hot and spicy. I wouldn’t call them mild either. I’d call them just right! Ordinarily when I make cornbread (or cornbread muffins), I use generic corn meal and follow a standard recipe using a ratio of 1:1 corn meal to whole wheat unbleached flour and the other “standard ingredients.” These muffins … are MUCH better than anything I’ve ever produced using that recipe. As for a tea recommendation, after tasting these muffins, if you want to really accentuate the corn flavor, try this Diyi Cornfields Shu from Verdant Tea – another product that really surprised me with its corn flavor! If you want to serve just ordinary cornbread … stay with the corn meal you’re using now. If you want something that will really impress someone (even if that someone is you), you must give this mix a try. I really was not expecting to be as happy with this corn meal mix … I actually had a reaction that was sort of like “eh… why is this in the box?” But after tasting it, I can say without hesitation that this mix makes the best corn bread muffins ever! Our most popular seller, this old world heirloom dates back to early civilization. The term Emmer refers to the type or species of grain. 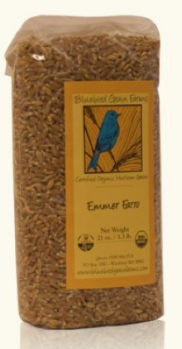 Emmer is the original farro (old world grain), a simple grain of 28 chromosones that pre-dates spelt. It is prepared like brown rice, cooks in 50-60 minutes or can be soaked overnight to reduce the cooking time. It makes a fabulous pilaf, grain salad, risotto, additive to soup, or sprouted for breads and salads. When cooked, its dark, plump berries add sweet, full-bodied flavor, chewy texture, and high nutritional value (over 16% protein) to every meal. It is a lovely, versatile grain that is a staple in our household. 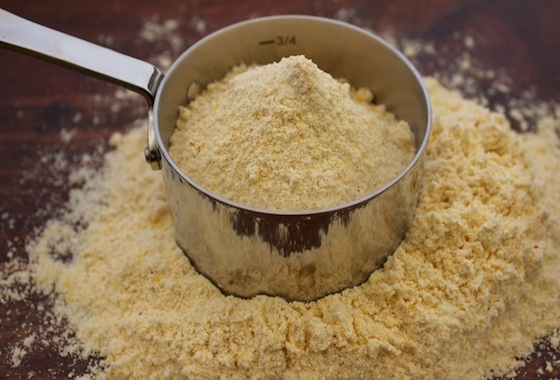 When mixed with lentils or chickpeas, emmer makes a complete protein. Wow! It’s been ages since I’ve had farro. Trying it again after so long makes me wonder … just why have I not eaten farro in so long. It is so delicious! I think it may be because it is a little more difficult to find (It isn’t on my usual grocery store shelves) but it certainly isn’t impossible to find. I haven’t really looked at Whole Foods, but I am sure I’d probably find some there. It also takes longer to cook than other grains. I boiled the grains for 15 minutes and served it with a sprinkling of sea salt and a little butter. It is a very hearty, toothsome grain, although it is a bit on the hard side with just 15 minutes of cook time. Hard, but not inedible. For a more tender farro berry, I would recommend simmering it longer, or pre-soaking the farro. As it is though, I like it at 15 minutes. It makes for a deliciously different hot cereal. Chewy and rustic, with a sweet, nutty taste. It doesn’t need any additives, but I do like the addition of a little butter as it adds a little creaminess to it. A longer cooked grain might also be nice served with a little milk. I really enjoyed this opportunity to rediscover farro. This farro is delicious and hearty!